With fall officially here and weather starting to chill, many of you will need something to keep cozy with as you watch your favorite teams this football season! 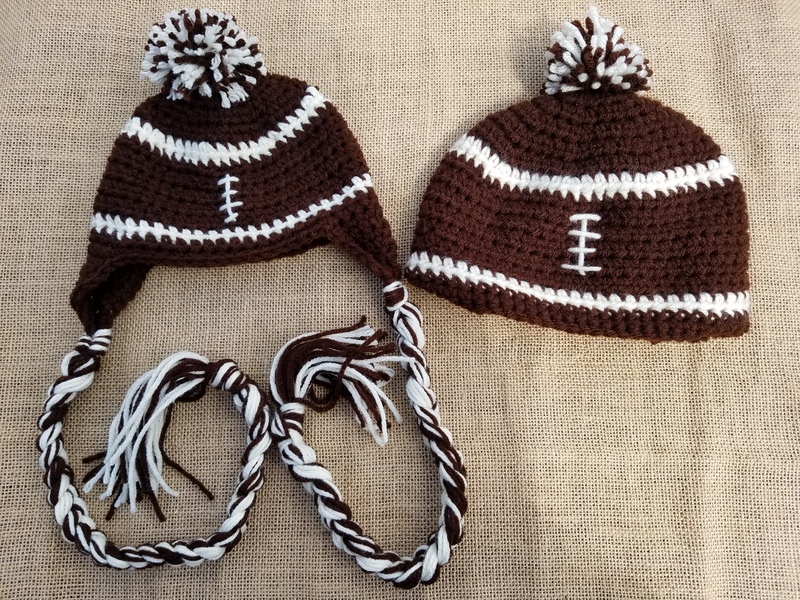 Whether it be NFL or your local school event, these hats are perfect for any chilly autumn evening! Personalize them to fit your team’s colors for extra cheer! For now though, enjoy the child size version through here. The child size fit both my five and seven year old perfectly and I would recommend it for ages 3 to 10. -Worsted weight yarn in colors brown and off white. If you want this piece to be just a beanie then finish the hat off with one additional round of sc to act as a border. If you want your hat to be an earflap hat continue to “Earflaps” after round 10. Sl st in the next 10 spaces. Now you will begin to sc in the next 10 sts for a total of 10 sc. Ch 1 and turn to begin your rows for the earflaps. Rows 1-2: sc across; ch 1, turn. Row 3: dec, sc in next 6 sts, dec; ch 1, turn. Row 4: sc across; ch 1, turn. Row 5: dec, sc in next 4 sts, dec; ch 1, turn. Row 6: sc across; ch 1, turn. Row 7: dec, sc in next 2 sts, dec; ch 1, turn. Row 8: sc across; ch 1, turn. Row 9: dec twice. Fasten off. Now just make a pom pom using your pom pom maker using strands of both brown and off white yarn. Sew the pom pom on top of your hat. Embroider the laces in the front middle of the hat. Enjoy your cozy football hat! I need the directions for 0-3 months.